A van pulls into Sam’s Club parking lot in Dallas and 2 volunteers spring into action, handing out up to 2 packs of diapers and wipes to more than 500 qualified low-income families who depend on this diaper drop so that their children can go to childcare while the parents go to work. In Pennsylvania, a diaper pantry keeps families from choosing between having enough food or putting diapers on their babies. In Los Angeles, 1 diaper depot hands out more than 1.5 million diapers a year. In St. Louis, Nurses for Newborns provides diapers for more than 2,600 families out of the passion that mother/baby nurses have for their smallest patients and their parents. All of these efforts made headlines in their local newspapers, but across the country, there’s a larger unspoken and unmet need for 5.4 million children who don’t have enough diapers. Throughout the US, community diaper banks, religious and philanthropic organizations and individuals strive to meet the needs of the 1 in 3 families who struggle with diaper need—the inability to buy any or enough diapers for their child. When a baby doesn’t have enough diapers to go to childcare mom or dad can’t go to work. And these wee ones need between 8 and 12 diapers a day. Diaper need is not having enough diapers to keep your baby clean, dry and healthy. When diapers aren’t regularly changed, baby’s skin is exposed to urine and stool, which can lead to diaper rash. Left untreated (and yes, diaper cream is another cost of diapering), skin breakdown can happen and lead to infection requiring medical care. 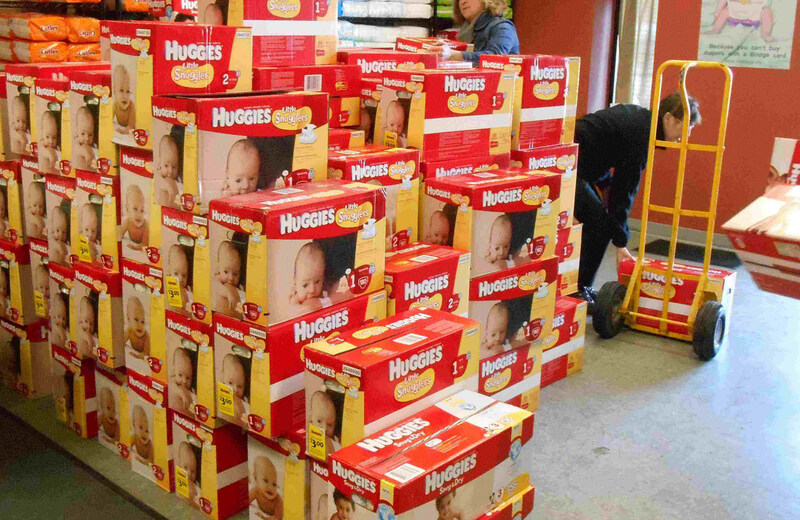 No state or federal programs help families buy the 3,000-5,000 diapers each baby needs. You can’t spend food stamps for diapers. The one bright spot is the non-profit National Diaper Bank Network, which connects and supports the country’s 240+ community-based diaper banks that collect and distribute free diapers to struggling families. Last year, the national network distributed more than 40 million free diapers, half of which were donated by founding sponsor Huggies® to some 1.2 million children in the US. Each year, the nurses of AWHONN are working with diaper maker Huggies and the National Diaper Bank Network through the Healthy Mom&Baby Diaper Drive to meet the needs of families in their own communities. Nurses are with moms when they first learn they’re pregnant. Nurses give expert care and advice as moms go through prenatal visits. Nurses help moms birth the 4 million babies born in the US each year, and nurses are the ones moms confide in regarding needing extra diapers before they take their newborn home for the hospital. Nurses are known for collecting and donating diapers to local groups in their communities, including the diaper banks that support struggling families.